When homebuilder Jason Black sent me photos of a house he designed and built in Kentucky, it wasn’t at all what I expected. It looks like it’s been there a lot longer than a year, doesn’t it? My dream house would look old like this on the outside but function like a new (low maintenance, all the amenities) house on the inside. The house is called The Palazzo and was Stonecroft’s Southern Living Showcase home of 2010. 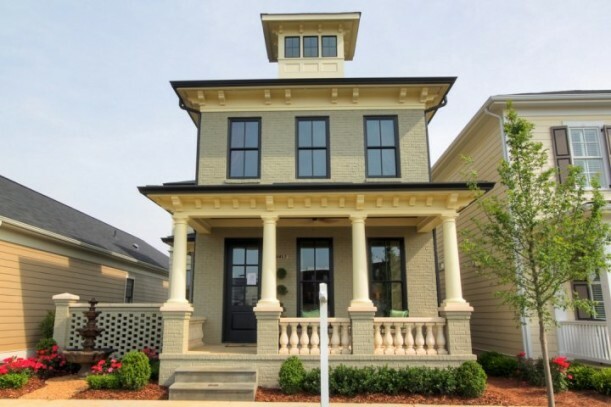 The Palazzo was named the best floor plan by the Home Builders Association of Louisville. Thanks, Jason! You can see the rest of the photos on the Stonecroft Facebook page. WoW! Very elegant home. Love all the great trim work. You nailed with this one, julia! There’s nothing that I don’t LOVE about this house! Nothing at all! Everything is done to perfection! WOW! Post of the Day: Michael Jordan buys a dining table with thousands of holes! Love this house!! That kitchen is fabulous!! I really like this house a lot! It does look like it’s been there for a lot longer than a year. I love this wonderful home! 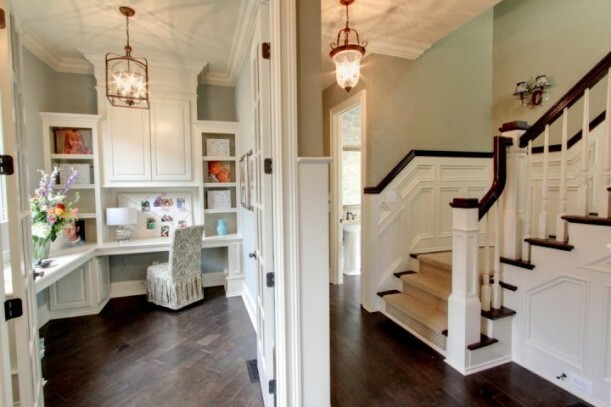 It is great to see builders really utilizing all nooks & crannies and keeping homes charming & so live-able! I must say the staging inside really sets a great tone as well, not stuffy at all but soft colors & warm palettes really photographs amazing…thanks for sharing! Wow! So beautiful! It’s a little frilly for me personally, but bones are stunning! One of my dearest friends of over 50 years lived in St. Thomas, Ontario, Canada and I flew into London last year when she passed away. My first time in Canada!. They were farmers, husband still is, wonderful people. I like the house *bunches* The office is so cute! I would use it as an art studio. I like the millwork and the colors used. Gorgeous! Thanks so much for sharing it with us, Julia! Agree Julia, we have a couple of great builders in Kansas City who do that…respect the past with all of the amenities of the new! This is FABULOUS. Now I’m off to go research this home…I hope there is a floor plan somewhere. That kitchen opening to the living room is perfect. And the office in the hallway. Really great, thanks for sharing! im in love with it!! I like a more traditional home with some character…all the new builds seem so blah and cold to me…this is really a beautiful home..thanks for sharing!!! I feel the same way that I would love new house amenities with the style and details of an old house! This is just stunning! I’m guessing that since it was a show home at the time, they didn’t want to encourage any visitors to use it. Ha. Great architectual details. I’d love to decorate it my style. Yes, a beautiful new home. I could live there and I prefer old houses…but I could certainly live in this one. Love the way it’s decorated too. Love the charm and character of an old house, but the low maintenance of a new one. This one is perfection…thanks for sharing! Gorgeous! Looks like the classic foursquare homes we have on Capitol Hill in Seattle, all built in the early 1900s. Oh … I love it! Wow! That bedroom is absolutely beautiful! What great details! I love everything about it. Wow, what a beautiful home. I love all the details and wood work. The interior colors are so soft and calming. I could move right in and feel at home. Thank you so much for sharing. I just visited their Facebook page and enjoyed looking at all the photos. It gave me lots of ideas on some areas I would like to redo in our home. Thank you for sharing. The kitchen is magnificent! I also love the powder room and all of the beautiful woodwork. Yep. This is a winner. And you know what I’m going to say: It’s all about the fantastic chunky, white woodwork, beautiful wood floors and excellent lighting — the trifecta that makes the home. maybe the cupola has blackout shades on remote control? that’s what i’d do! Great looking house! I love all of the details, colors and style. Jason really did an awesome job. That’s beautiful! I too love the cupola, but would be unhappy early in the mornings! 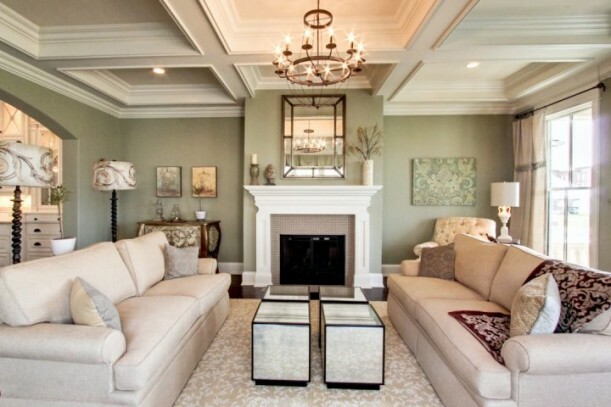 The ceilings in the living room are gorgeous. Yippee!! I can’t wait to get home from Laos and drive only 65 miles to Louisville to see this house. Our new place is being remodeled right now while we are away, and maybe I can get some new decorating ideas. What a great home. Lots of pretty details. Love the colors! Hi Julia. The back hall alone is to die for! I would not change a thing. Total dream house – Thank you for the thrill. It’s really a stunner! 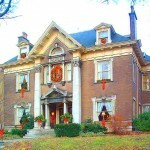 There are some amazing homes in Louisville and this is another one. Hey….I live there!! Louisville, that is …not the house (I wish though). It is located in Norton Commons, a newly built community in Louisville’s VERY rich east end part of town. Thanks so much for featuring something from the city I love so much! Elegant, but practical, too! Thanks for sharing. 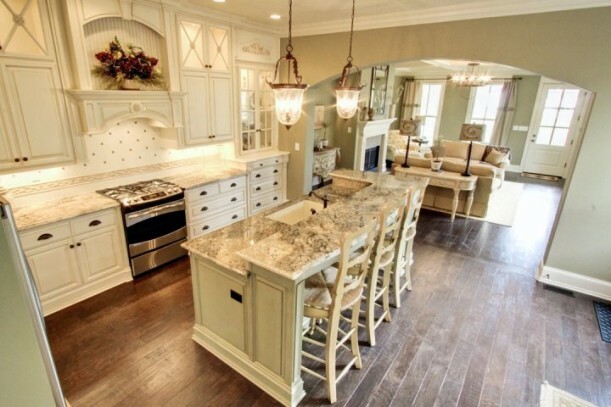 What a fabulous home…you were right…probably my dream kitchen also. I just swooned a bit. I would love to have a new house that looks old like that. All that detail! Oooo! The ceiling in the living room alone just gets me. Great house! Louisville is my hometown and where I live and work now! I love this house. Norton Commons is a very cool community. Wow. 45 comments. Apparently a lot of people like me love this house. Just when I think I want to go more modern then I see this and I am all confused again. I especially love the black painted banister and steps. Jaw dropping gorgeous. Hi , I live in this house! I can tell you I am very pleased with the design, space, and functionality. The cupola is NO problem! Light does not filter downward, but you look up and see the most beautiful scenery from it! I have seen the moon, flocks of geese, and brilliant blue sky! I love my bedroom, I joke that it has it’s own zip code! Thanks Jason and David for building this beautiful home. P.S. the office and basement is awesome too! That is awesome! The house is gorgeous, I love everything about it. I don’t usually see houses that are perfect, but this one is! I LOVE that kitchen! The hardwoods are so beautiful! I also love the office! What a beautiful home! Absolutely gorgeous trim work! I just spent over an hour admiring the photos on their website. THEN, I had to go grab my husband and start over! Love. Love. Love… the details. These builders should be so proud. Love the house! So beautiful and charming. Hate the lot! So close to the other houses. I love it from the outside except I think the cupola is a bit pretentious for the house on the small lot. And from what I can see I think I would like the floorplan. For me some of the interior details are a little too gaga/ornate for the exterior. 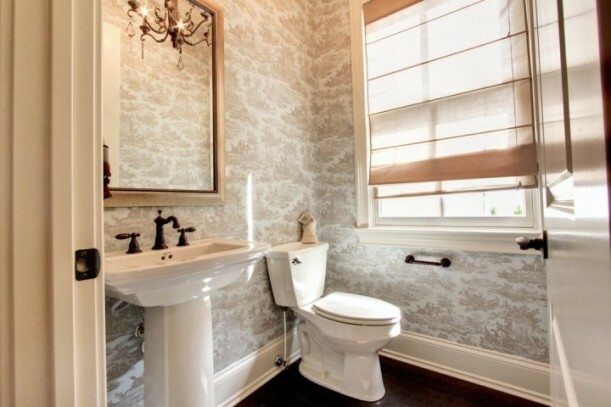 Oooh, you had me at the toile in the powder room! What a gorgeous house! Finally a new home builder that gets “it”! Stunning! I would love to see what the floor plan looks like……anyone have any luck finding it online? Gorgeous! Lucky homeowners to have such a nice home. I really like the cupola and the kitchen floors. I like that it isn’t cookie-cutter modern on the inside. Hopefully more home designer/builders will take note. Yes, please! Love this house! I also love that this is amity example of how there is a shift toward quality over quantity. Gone are the days of McMansions. We bought the home we just moved into because it didn’t have a two story entrance. All the other homes in our price range had them and I find them too big for my taste. Our home has a beautifully trimmed and cozy entrance. And this home has a Facebook page! I’m off to go check it out! Yummm. That house is fantastic. And I’m with you–the very best thing is when new houses have old-house charm. One of my favorite things about our house is that it’s a new house in an old neighborhood. One thing our builder did right was to site our house back from the road, tucked into a hillside, so that from the street it just looks like a house that kind of grew there. Love that! My dream house, too! Right up there with Something’s Gotta Give house. And that master bedroom. Don’t think I’d ever leave. Just gorgeous. Who decorated the Southern living showcase home in Kentucky? I think I LOVE everything about this home!! It’s just gorgeous. I want to go take a tour!! I love houses like this. A friend of mine and I were actually looking at houses and townhomes in a newish development in Chilliwack, B.C., Canada. The development/community is called Garrison Grossing if you would like to check it out. I believe it’s the first result on Google. I especially like that it is hard to tell the difference between the original houses and the ones that are brand new but built with character and charm. I’ve been through that house! I can assure you that it is every bit as attractive as the pictures suggest, I just wish I had a client looking in that part of town! It looks old but it still got class and style. I like on how the room looks spacious due to the large windows. And each room still retains its cozies characteristics. Very lovely house indeed! Wow, I hope more builders follow Jason’s lead — more details, less square footage! Gorgeous home! Can you share the paint colors and brand, particularly in the master bedroom?